Queen Abigail the Wise opens with little Abigail at church on the first week of Lent, and it ends with her next door in the church’s social hall after the late-night service of Pascha (which non-Orthodox call Easter). Even when the action happens somewhere else, the church is never far out of the picture. In Abigail’s case, that’s St. Michael the Archangel Orthodox Church in Benton Bend, Missouri (and I made up all of that except Missouri, by the way), but the larger frame of reference is the Orthodox Church, which is sometimes also called the Eastern Orthodox Church or the Orthodox Christian Church. I don’t think that a person has to be Orthodox to read Queen Abigail — at least I hope not; that wasn’t my intention — but I realize that a reader that is non-Orthodox or that is an Orthodox inquirer might feel a little lost sometimes. So here’s a bit of context just to help out. Historic — How historic? The simplest way to explain it is to take a look at the timeline of Christian history HERE. The Orthodox Church’s roots run deep — as deep as any church’s roots can run, really. Ancient — Maybe this seems redundant. But it has to do with the feel of the worship services. 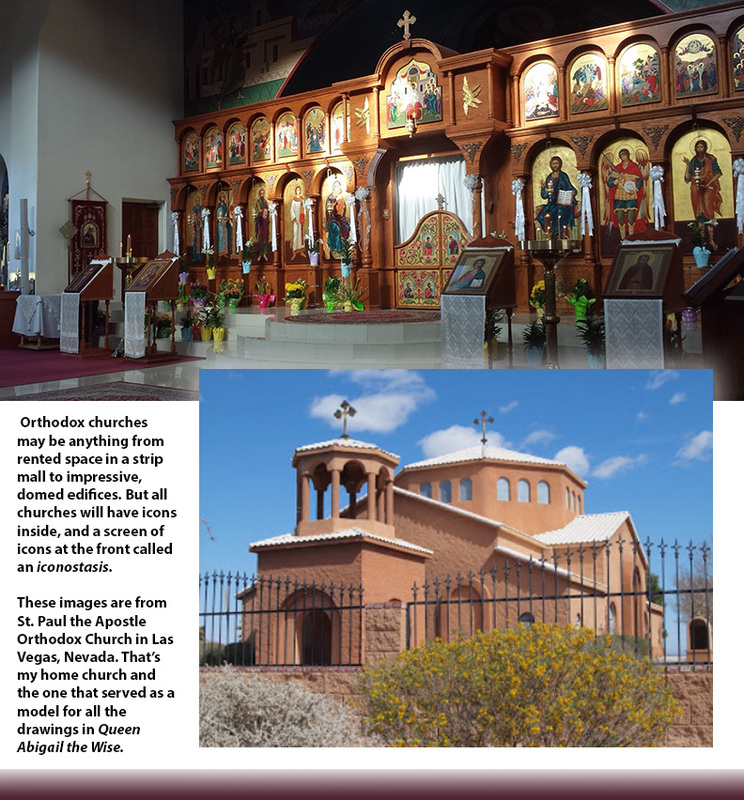 If you go to an Orthodox church’s Saturday night or Sunday morning worship service, you may feel like you’ve stepped out of a time machine. Not in the sense of hearing Old English; more in the sense of hearing the words of the psalmist — “Hear me, O Lord …” “Let everything that has breath praise the Lord …” — and feeling like it is finally in context. Authentic — Maybe that’s not the best word, but I can’t think of another one. All I mean is that it’s not some odd sect with strange beliefs about Jesus Christ, God, the Trinity and other essential doctrines of faith. Hierarchical and liturgical — Meaning that there is order to the service and a hierarchy of who does what, and it’s not up for grabs. These have been established over centuries, and there is a propriety to things that is almost shocking these days. Beautiful — Orthodox churches are a feast for the eyes and the ears, and even the nose and hands. There are icons that adorn the walls and in larger churches fill every space from the floor right up to the dome in the roof. There are hymns that may have been penned by saints in the 3rd or 13th century, and music that may have come from improvised Byzantine chanting or gifted Russian composers like Tchaikovsky or Rimsky Korsakov. There are candles, and incense. The church may be somber or brightly lit, and the tone of the music and even the vestments (the garments the clergy wear) match the tone. Dynamic — Life breaks in all the time, and that is by design. There are certainly many times when “the script” for the service calls for very human gifts of creativity, skill, innovation. In the talks of the priest or the singing of the choir, we are encouraged to execute a rather difficult kind of “performance.” But there are also quite a number of accidental moments, and those don’t derail things as much as you might think. Whether it’s baby talk or other background noise, not to mention all manner of comic relief, the services are never bereft of human touches. Meaningful — We have become so accustomed to our pop culture and its incessant desire to entertain us that you can almost forget sometimes that human beings are made in the image of God, that we were all made and fashioned for a purpose-filled life. But in the life of the Church, even the smallest things are invested with great meaning. There is history and the guidance of centuries of teaching even behind things like the colors on the icons and the phrases of prayers. If all of that sounds like biased, I admit that as a convert with 30+ years in the Orthodox Church, I am still amazed by it all the time. Lengthy — An average Sunday morning service runs well over an hour, and special services may go as long as three! It’s surprising how well a lot of children adjust to that, eventually. All the same, when you’re 10 years old, and your mind tends to wander … well, a little person just might find that she is looking for a diversion to pass the time. Part of an ongoing Church calendar — There is an order to how services appear in the year and some of what occurs in those services. The book opens just after Lent has begun. The Sundays of Lent all have certain themes to them, and that will begin to impact things in ways that Abigail doesn’t realize at first. But even on the first Sunday, as Abigail is sitting as quietly in church as she can, there is a certain theme that will begin to matter to her.